Ceil Solar Photovoltaic Street Lights are suitable for lighting roadways and other outdoor lighting. These are fitted with Compact Fluorescent Lamp (CFL) of 11 watt, which gives light equivalent to 75 watt incandescent lamp. The Lumen output of 900+50%. The fitting are lamp fitted with automatic dusk to dawn controller, which automatically switch ON the light at Dusk and switch OFF at Dawn. CEIL Low maintenance Tubular Battery (Rate of Discharge C10) used in the system with sufficient autonomy ensures smooth operation during prolonged non-sunny days. 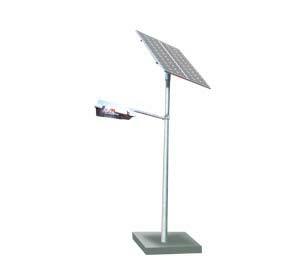 Ceil Solar Street Light requires minimum maintenance and is extremely reliable compare to other solar light. Lights are designed with less weight and dimension suitable for trouble free operation in extreme climatic condition. These are fitted with Light Emitting Diode (LED) of 6 Watt, 12 Watt etc. For example one 6 Watt LED based light can give light output more than 11 Watt CFL. The life of LED based fitting is 12 times the life of CFL, which ensure rare replacement of the Luminaire. The fittings are fitted with automatic dusk to dawn controller, which automatically switch ON the light at Dusk and switch OFF at Dawn. CEIL Low maintenance Tubular Battery (Rate of Discharge C10) used in the system with sufficient autonomy ensures smooth operating during prolonged non-sunny days. 1Burning Life of LED is 100000 hours whereas CFL last for 8000 hrs. Thus once LED based street light (operation: 12 hours every day) fitting is installed it works for more than 22 years as against 2 years in case of CFL. 2No need of Complicated Ballast and hence no failure of Ballast and Light Fitting. 3Penetration of Light is better than that of CFL. 4For being lower wattage, requirements for battery capacity and SPV Module reduce. Hence the system becomes more portable and less expensive.